LIKE NEW 17 READY TO GO This is a like new boat THAT IS INSIDE STORED, 90 YAMAHA 4 STROKE,CUSTOM BIMINI TOP SS FRAME WITH BETTER HEAD ROOM,GARMIN GPS, FULL BOAT COVER, SWIM PATFORM,ADDED GRAB BAR AT STERN,ADDED NON SKID AT DECK AT STERN, S/S PROP, JUST HAD YAMAHA 100 HOUR SERVICE PERFORMED, For years proud owners of our Rossiter 14 power boat have asked if we would build a runabout with the same classic look, fit and finish and unbeatable soft, dry ride that thrives in big water … but with a little more room and horsepower. So we created the Rossiter 17 Runabout knowing that some people want the protection of a full windshield and canvas. We also took full advantage of the latest in computer-aided design and 3D modeling to ensure that the hull performance and engineering delivered the stability, performance and sea-keeping characteristics you’ve come to expect from a Rossiter power boat, thus delivering the ride of something much bigger but with tremendous efficiency and speed. Powered by either 90 or 115 horses, this new Rossiter can take the whole family out for a day of picnicking and waterskiing or haul supplies back and forth with ease in almost any weather … all the while looking and acting like nothing else on the water. And surprising to most, with a 90 hp engine our Rossiter 17 jumps out of the water, with a full load with little to no bow rise and delivers over 100 miles of range on 27 gallons of fuel at 30 miles per hour cruising speed. And if you want speed, she can deliver 43 - 50 miles per hour depending on your horsepower preference. 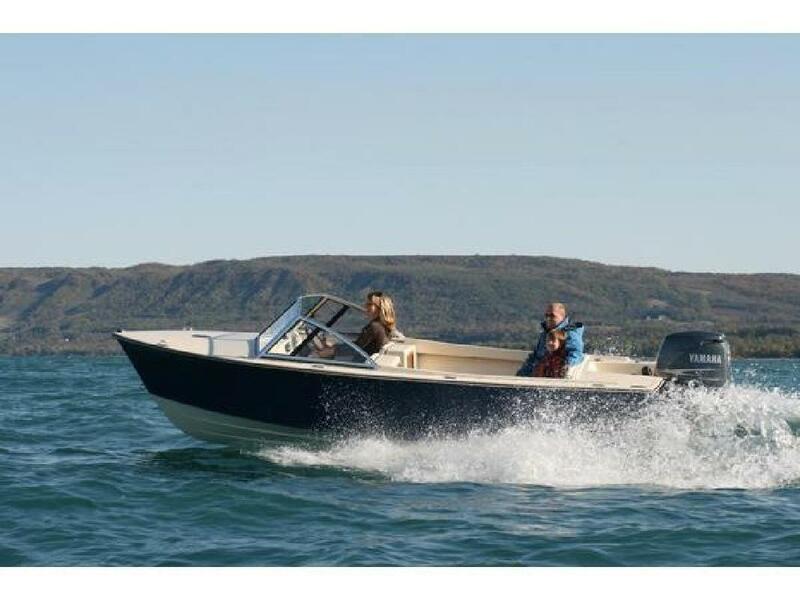 With respect to construction of a Rossiter powerboat, our hull design is unique to Rossiter with a focus on big-water performance, efficiency and ride, not to mention our commitment to quality fit and finish. Our boats have hand laid, solid hulls with a molded, foam-filled stringer grid, and the use of structural closed-cell foam cores used where needed to provide the necessary panel stiffness in our liners, decks and transoms. They also have a vinyl ester barrier coat to reduce the chance of osmotic blistering and print-through occurring. And, in fact, the only wood in our boats is the teak accents you see in the interior cockpit area. You should also know that our liners are bonded to the stringer grid, topsides and transom, independent of the deck assembly which is bolted to the sheer using machine screws every six inches though a 1/4 inch high density epoxy board which runs the length of the sheer. This method provides you with a very solid feel to the boat, thus enhancing the ride delivered by our hull shape and many years of enjoyment. Draft: 2 ft. 5 in.